Brody Emerson WILL NOT BE JARED. Okay so according to the IMBD "rumor" he was put down as Jared. Wallpaper and background images in the The Host club tagged: the host jared brody emerson twitter rumor imbd stephenie meyer. Woah.. What a moron. He can turn down roles because he won't do the homework to find out what it's about - well, then we don't want him! That's nice. Because if he played the role, I'd be really disappointed. He looks nothing like Jared. oh my god, im so glad he isnt! when i went on imdb i thought theyd got it wrong and ment he was playing jamie!! I saw this on IMDb today and I thought, "No frickin' way!" He looks nothing like Jared and he is a baby. This just shows all of us that we cannot believe any IMDb "rumored" roles. oh HELL NO !! Ewww he's so gross ! I'm soooo thankful he didn't even go to the audition xD Jared it's supposed to be a GROWN HANDSOME MAN ! 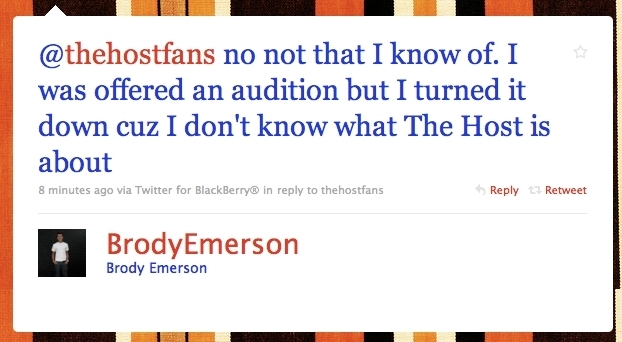 Luckly Brody Emerson isnt playing Jared. Rumor has it he has checked into Rehab in Malibu!!!!! Prays For him!